Although he lived a good sixty years, Romanian violinist and composer Grigoraş Dinicu is today remembered for a single work composed in 1906, at the tender age of seventeen. That piece, one of a handful of musical truffles on virtually every concert violinist's encore list, is the delightful “Hora Staccato”, a fast, virtuosic show-off piece in a Romanian dance style. Dinicu originally wrote it for his graduation from the Bucharest Conservatory, and performed it at the ceremony. “Hora Staccato” takes its name from the “staccato” (Italian for “detached”) articulation that it features so prominently. 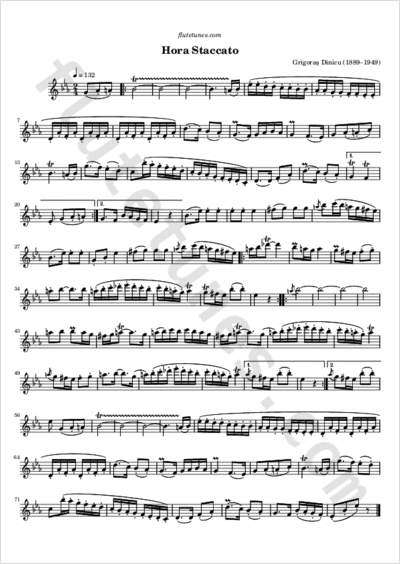 More specifically, this piece demands a particular type of staccato, known by violinists as the “up-bow staccato”, in which many clearly articulated notes are played in rapid succession without changing the bow direction.